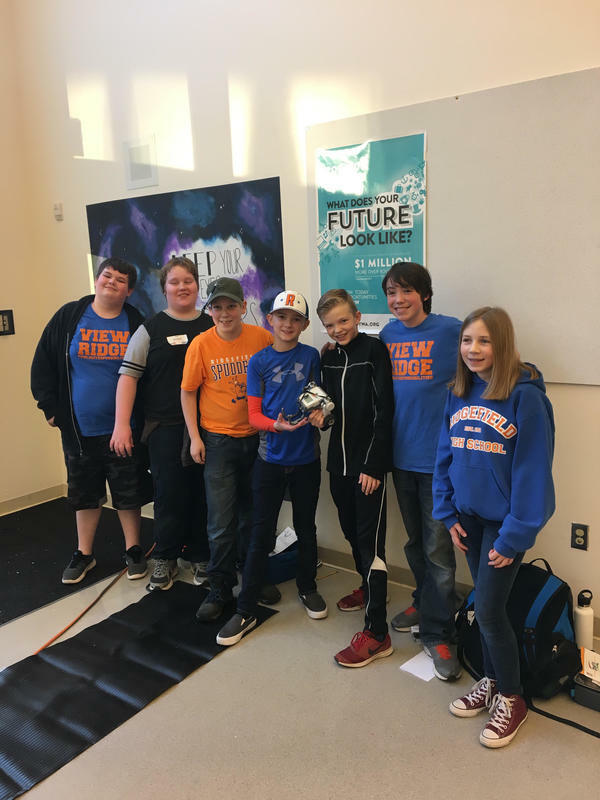 Last month, two robotics teams from View Ridge Middle School participated in a FIRST LEGO League Robotics qualifying competition at Washington Middle School in Olympia. 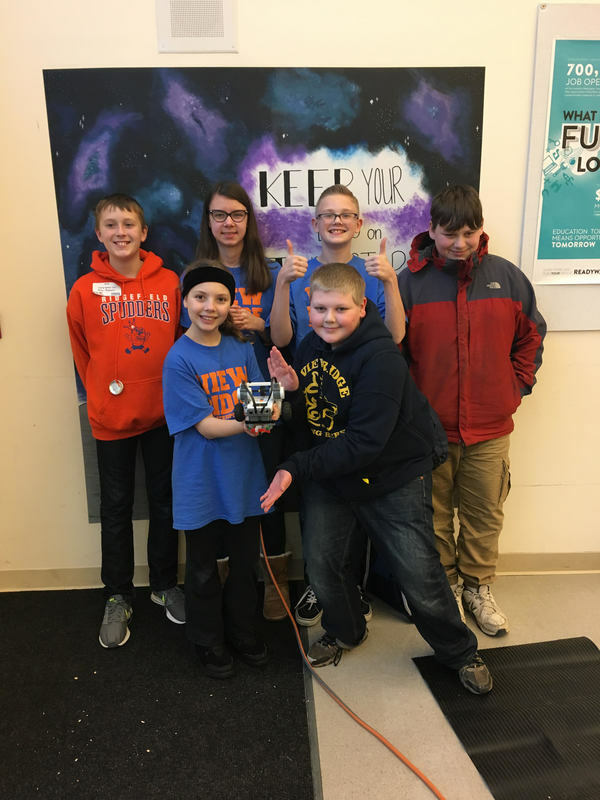 The VRMS Rebels (also known as “The Squishies”) and VRMS Rebels Too (also known as “The RoboRebels”) are coached by View Ridge English and history teacher, Raechel Cowell. FIRST (For Inspiration and Recognition of Science and Technology) is a nonprofit international youth organization founded in 1989 that operates the FIRST Robotics Competition, FIRST LEGO League, FIRST LEGO League, JR. and FIRST Tech Challenge competitions. 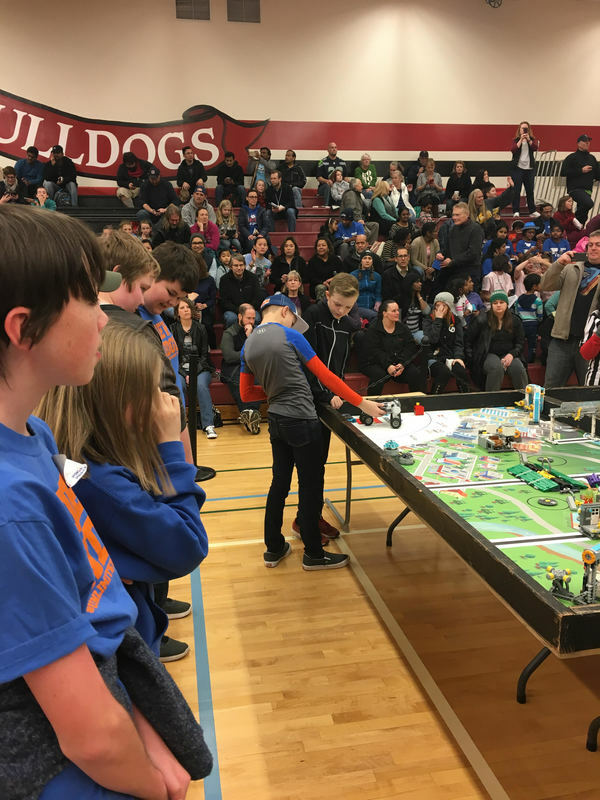 FIRST LEGO League team competitions require student teams (in Grades 4-8) to design, build, and program a robot using Lego Mindstorms technology and drive it to complete challenges on a table-top playing field. This year, teams were also presented with a real-world problem (hydrodynamics) and were required to develop a solution by collaborating with community members and doing research culminating in a presentation to judges at the competition. The competition helps participants learn to apply science, technology, engineering, and math concepts (STEM) along with creativity to solve a problem. Along the way, they develop critical thinking and team-building skills, basic STEM applications and presentation skills. In addition, by embracing FIRST’s Core Values, participants learn that friendly competition and mutual gain are not separate goals and that helping one another is the foundation of teamwork. The event provided the middle schoolers with the opportunity to meet students from other schools, get to know their teammates better and to have fun. VRMS Rebels team (a.k.a. The Squishies) from left: William Sowders, Jud "JP" Kennedy, Carter Long, Cayden Lauder, Kaison Apol, Liam Rapp, and Isabelle "Izzy" Sheley. Christian Duquette (not pictured) is also part of the team. VRMS Rebels Too team (a.k.a. The RoboRebels) Back row (from left): Parker Staker, Mara Schwenneker, Dominic Harris, John Stryker. Front row (from left): Catalina Hagen and Gabriel Thomas. Other team members (not pictured): Olivia DesRochers, Aaron Breitengross, and Megan Weber. The View Ridge robotics teams gratefully acknowledge the support they received from Ridgefield High School’s Steel Ridge Robotics Team (Coach Jeff Brink and students Jake McCarthy and Eli Holter) and parents Chad Stryker, Mitzi Staker, and Timm Sowders. “Being my first year doing robotics, I really enjoyed myself and found the entire robotics community very supportive,” said Cowell. FIRST LEGO League is an alliance between FIRST and the LEGO Group. It was founded in 1998 by FIRST founder Dean Kamen and owner of the LEGO Group, Kjeld Kirk Kristiansen to engage children in playful and meaningful learning while helping them discover the fun in science and technology.